Our product range includes a wide range of Non Stick Kadai. Keeping in mind the diverse requirements of our esteemed clients, we are engaged in offering a wide range of Non Stick Kadai all over the country. The complete range of our products is made up of top-grade base material which is very different from the products that are available in the market. 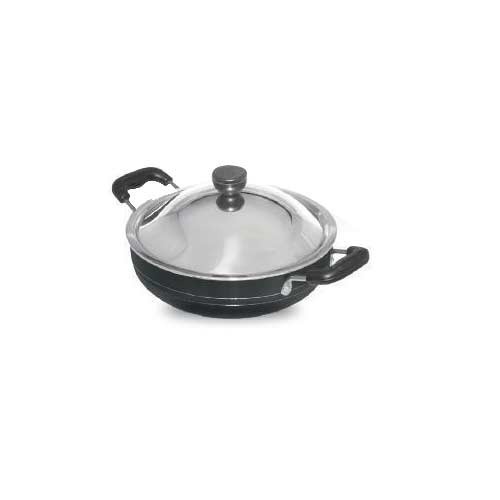 This Non Stick Kadai is stable and has high strength. Known as a renowned organization, we are engaged in offering an extensive range of Non Stick Kadai to meet the needs of our customers. The Non Stick Kadai is coated with best coating material and is user-friendly and ensures longer durability. In addition to this, the product is also known as TRIPLE COATED KADAI WIYH INDUCTION BASE. Backed by the years of experience and vast knowledge, we are involved in dealing a wide range of Non Stick Kadai. The Non Stick Kadai has a smooth and fine finishing the quantity that can fit in it is appropriate for regular use to our clients. Furthermore, the product we offer to our clients is highly durable in nature and needs very low maintenance and care. Due to the increasing demands of our valued clients, we are involved in dealing a wide range of Non Stick Kadai. The product is smooth from surface for the plain which allows it to be used easily. The product that we offer is available in different sizes as per the needs of our esteemed clients. To conclude, we offer this Non Stick Kadai at affordable rates.